Superior protection for your kamado grill from harsh weather and debris. This unique kamado cover features the patented Innerflow System which prevents damaging condensation from building up on the grill, while keeping the weather elements out. Made from a weatherproof heavy-duty vinyl/polyester material that does not crack or peel, and easily fits over your kamado grill. Tie down straps with a quick release buckle keep the cover secure. The cover is also UV protected and will remain mildew and fungus free, and comes with convenient handles for easy removal and hanging rings for storage. Protect your TravelQ 285X and PRO285X with Scissor Cart using this Premium Grill Cover. Cover the cart while it is in the assembled position instead of collapsing it and storing your barbecue every time. The durable, water-resistant fabric of this cover won't crack, and the improved UV inhibitors provide superior fade resistance. For year round, full weather protection for your portable grill, the Premium Grill Cover can't be beat. Adjustable straps with buckles keep the cover in place, while the vent allows for airflow preventing mildew, as well as protection on gusty days. Easily store your cover out of the way with the convenient hanging loops. 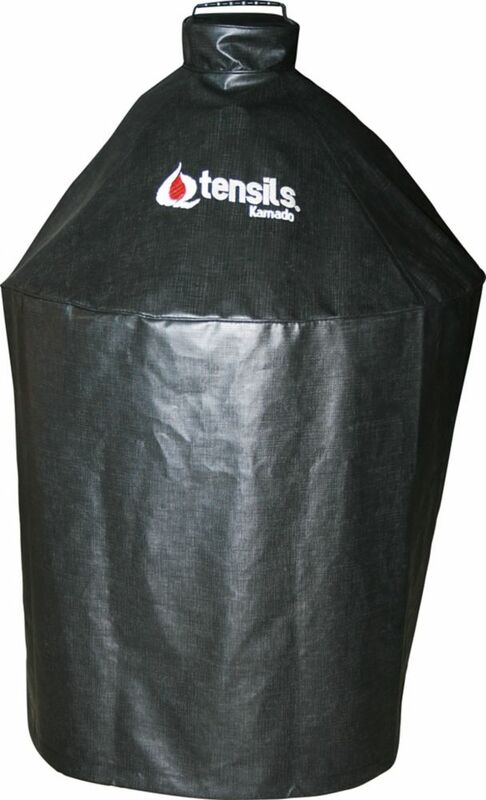 Innerflow Series Ventilated Kamado Grill Cover - 34 Inch Superior protection for your kamado grill from harsh weather and debris. This unique kamado cover features the patented Innerflow System which prevents damaging condensation from building up on the grill, while keeping the weather elements out. Made from a weatherproof heavy-duty vinyl/polyester material that does not crack or peel, and easily fits over your kamado grill. Tie down straps with a quick release buckle keep the cover secure. The cover is also UV protected and will remain mildew and fungus free, and comes with convenient handles for easy removal and hanging rings for storage.